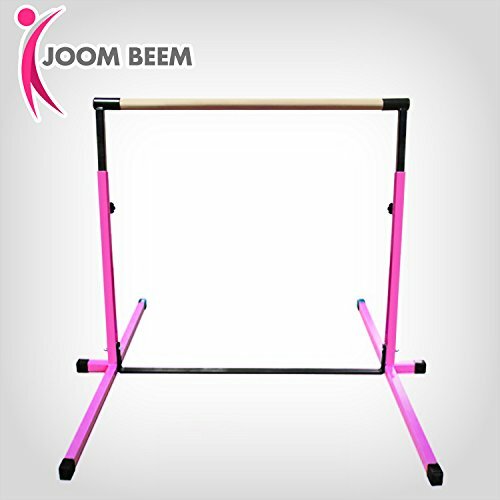 The perfect starter equipment for budding gymnasts, the Joom Beem Adjustable Horizontal Bar is also a great activity equipment for toddlers to pre-teens. The Joom Beem Adjustable Horizontal Bar is great for the young beginners. It is made of light, high-quality material that provides a safe and sturdy platform for kids up to 14 years old to practice and perform horizontal bar gymnastic moves. The horizontal bar height can easily be adjusted from as low as 3 feet (36 inches) to as high as 5 feet (60 inches) with 6-inch increment heights in between. This means your budding gymnasts can use this equipment continuously as they grow older and taller. It works best when used together with the Joom Beem 8 feet by 4 feet Gymnastics/Tumbling Mat. Made from solid stainless steel, quality wood, and tough rubber, the Joom Beem Adjustable Horizontal Bar is designed to last a lifetime. The horizontal bar is made from strong wood finely, sanded to 1 ½ inch diameter, able to handle weights of up to 100 lbs. The supporting bars are made from powder-coated, non-corrosive, precision stainless steel held together by ultra secure stainless steel screw bolts locking everything securely and safely into place. Soft rubber end caps are strategically placed to ensure complete safety during use. It is truly the perfect gymnasts’ practicing tool from level 1 up to level 4.